Make it through the hormonal roller coaster of your adolescence and you'll know that greasy hair is a condition many go to great lengths to avoid. This teenage trauma can make adding oil to your hair seem counter intuitive, but botanical ones such as argan, coconut and jojoba can be an instant cure for a number of bad-hair-day woes. "The purpose of oils is to leave the hair shiny, freeze free, control fly-aways and provide hydration," says Corin Berry, owner of Salon Soap on Dundas Street West in Toronto, where she uses R+Co's Tinsel Smoothing Oil on clients of all hair types. Whether your hair is short, coarse and curly, or long, thin and straight, Berry says an oil can improve manageability, texture and finesse. Those with an already greasy disposition need not worry about overdosing, as Berry says that oils should never be applied near the scalp, which is the source of sebum. Instead, spread it from the mid-lengths to the ends, and think small. "Always start with a little bit, see what your hair is telling you and then add more if you need to," she says. If you find your oil is weighing down your mane, try it on wet hair – the water will dilute the product. To help quench dehydrated hair, Berry has a favourite bedtime ritual using the coconut oil in her kitchen cabinet. "I find a nice routine at night time that you can do at home is apply coconut oil to dry hair – mids and ends – braiding it and then washing it in the morning," she says, adding that a little coconut oil goes a long way. And who doesn't want to drift off to a scent that conjures dreams of sunbathing on a beach down south? Hair Rituel by Sisley Precious Hair Care Oil, $130 at Holt Renfrew. From Parisian skincare brand Sisley's debut hair collection, this blend of shea, moringa, cottonseed and passion fruit oils nourishes hair while adding radiance and shine, and can be applied throughout the day to bring back some lustre. Redavid Orchid Oil Treatment, from $14 through redavidhair.com. Orchid oil is the star ingredient in Vancouver line Redavid. It's so lightweight they recommend it can be applied to roots to help control frizz, add shine and soften hair. 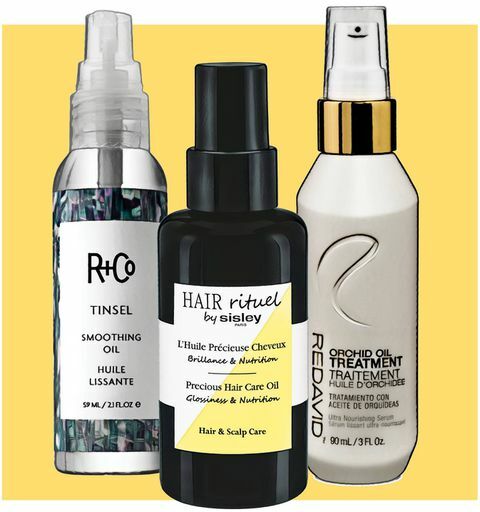 R+Co Tinsel Smoothing Oil, $31 at salons and through nordstrom.com. Made with argan oil, vitamin E and jojoba oil, Tinsel protects as well as hydrates, shielding hair from environmental aggressors and heat styling.